The world’s energy needs are expected to skyrocket thanks to population growth and higher demand from developing nations, making thorium reactors increasingly appealing. While uranium-driven reactors are being built in large quantities around the world, these reactors are not without drawbacks. Nuclear meltdowns remain a concern, and uranium has some negative connotations due to its association with weapons. 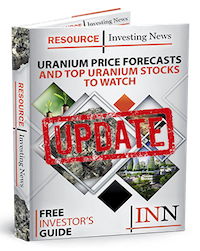 Some also claim that uranium’s low price makes it an unsustainable option, despite predictions of a price rally. Thorium, on the other hand, is seen by some as a less dangerous, more environmentally friendly path. So how does thorium play into the future of global energy? Thorium is a slightly radioactive metal that occurs in rocks and soils. It is more abundant in nature than uranium and is fertile rather than fissile, meaning it can be converted into fissile material through radiation. It is meant to be used alongside fissile materials like recycled plutonium and uranium. Despite its benefits, using thorium as a primary source of nuclear energy is challenging. The World Nuclear Association notes that extracting latent energy is still difficult to do in a cost-effective manner, and research into refinement technology will be needed if thorium is to be turned into a viable source. That said, it’s worth noting that the question of whether thorium reactors work for energy production was answered in 2013, when privately owned Norwegian company Thor Energy began using thorium to produce power at its Halden test reactor in Norway. “It is the fundamental first step in the thorium evolution,” Thor Energy CEO Oystein Asphjell told Reuters at the time. Thorium can’t split to make a nuclear chain reaction like uranium. In scientific terms, it isn’t fissile. However, if it is bombarded by neutrons from a fuel that is fissile — like uranium-235 or plutonium-239 — it is converted into uranium-233. The process creates energy and is self-sustaining after it begins; fission of uranium-233 turns more thorium nearby into the same nuclear fuel. There are many more complex processes involved, but this relationship between thorium and fissile materials serves as the foundation for thorium reactor technology. It’s important to understand the differences between uranium and thorium when considering developments in nuclear energy. Here are a few key ways they differ. One reason thorium is an interesting alternative to uranium is that it is cheaper and more abundant. Thorium is also used more efficiently in the reaction process — thorium inputs are almost completely used up during a nuclear reaction, meaning waste is reduced to a minimum. That is especially important considering the longevity of nuclear waste in the environment. The dangers of uranium — widely publicized in the wake of the Fukushima disaster in 2011 — are a key reason why experts are giving thorium reactors serious consideration. As thorium is not fissile on its own, reactions could be stopped in case of emergency, according to Forbes. Thorium is considered a strong choice for non-proliferation when it comes to nuclear weapons, but it is also important to note that there have been occasions in history where nuclear weapons based off of thorium have been detonated. While that is a risk, the nature of these weapons makes them difficult to handle and easy to detect. As a result, the use of thorium reactors could allow countries like Iran and North Korea to benefit from nuclear power by minimizing concerns that they are secretly developing nuclear weapons. Thorium and uranium have an interesting relationship in that they are complements and competitors to each other. Thorium can be used together with conventional uranium-based nuclear power generation, meaning a thriving thorium industry would not necessarily make uranium obsolete. Thorium is present in small quantities in soils and rocks everywhere, and it’s estimated to be about four times more plentiful than uranium. India holds the largest thorium reserves in the world, though reserves are also significant in China, Australia, the US, Turkey and Norway, as per Reuters. The metal can be found in epigenetic vein deposits, low-grade deposits and black sand placer deposits. Though it is abundant, few companies are currently exploring for thorium. In 2014, exploration and development of rare earths projects associated with thorium was underway in Australia, Brazil, Canada, Greenland, India, Russia, South Africa, the US and Vietnam. Skyharbour Resources (TSXV:SYH) is one company currently exploring for thorium. Its Falcon Point uranium and thorium project is located in the Athabasca Basin in Saskatchewan. As mentioned, Thor was the first to begin energy production through thorium, but it now faces competition from firms across the globe. For example, India has been interested in thorium-based nuclear energy for decades, according to the US Geological Survey. The country’s nuclear developers have designed an advanced heavy-water reactor that is specifically aimed at using thorium as a fuel. China is also a major player in the development of thorium reactors. The country has committed to spending $3.3 billion on two molten salt thorium nuclear reactors in the Gobi Desert. China hopes to have these reactors operating by 2020. In Indonesia, ThorCon and the country’s government are working on launching a molten salt thorium reactor that is expected to be operating by 2025. As can be seen, thorium has been considered an excellent nuclear energy alternative for decades. It’s hard to believe that the safety and efficiency benefits have not led to more popular use of thorium reactors — but there are reasons for that. Put simply, thorium-based reactors are still not economically viable for the most part. Uranium has benefited from decades of research, development and infrastructure thanks to its dual applications in weapons and energy during the Cold War. This research has allowed countries to establish protocols, infrastructure and knowledge bases that make uranium-based energy an easier option. The result is that at least for now thorium reactors are unlikely to gain the upper hand over uranium reactors. It’s possible that thorium reactors could become more dominant in the future, but a lot of work will have to be done to get to that point. What do you think of thorium? Will it be the future of nuclear energy? Arafura Resources Nolans Bore rare earths resource in Australia’s Northern Territory is Australia’s largest hardrock thorium resource, at approximately 56 million tonnes @ 0.27% ThO2, or 150,000 tonnes of contained ThO2. There’s no such thing as Thorium reactors. Thorium is a nuclear fuel. It can be used in several sorts of reactors. The Unicorn is Thorium Breeder reactors that can use Thorium with 99% efficiency. Meanwhile modifying existing reactors to use part Thorium fuel can reduce need for Uranium while increasing reactor power, improving economics and safety of such reactors. Yes, certainly part of the future and very soon in several countries, Canada being the closest. Reasons: efficiency, safety, cleaner aspects – less waste, more plentiful element, potential for modular designs in remote locations – read third world. Older methods will be displaced not Uranium. How long will we be using coal when this is fully onboard.